Details relating to the Belgian Commemorative of 2015. 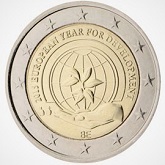 Belgium issued the coin as a tribute to the “European Year of Development”. The motto is “Our World, Our Values, Our Future”. The central idea is to inform citizens of the cooperation of the EU countries in development and make them feel a part of this process. In the inner circle a hand is shown holding a globe -the earth – with a plant growing in the foreground. Around the upper edge of the inner circle is the inscription “2015 EUROPEAN YEAR FOR DEVELOPMENT”. The designation of the issuing country “BE” is at six o’clock. The mark of the mint master (a cat) and the mint mark are at eight o’clock. Return from Belgian Commemorative 2015 to euro coin collector.